I now offer general EV consulting. The kit is split into seven individual PCBs: the main board hosting the STM32, 2 current sensor boards, a voltage sense board and 3 gate driver boards. If you have a kit with the large sensor board, look here for instructions. Check out the assembly video. The names of the individual parts are printed on the PCBs. The kits info sheet contains the BOM for all boards. Assemble the PCBs accordingly. Whenever applying power, make sure to set a sane current limit as to not feed too much energy into a possible fault. Especially before inserting the STM32-H103 module make sure that the power supply is at the correct level (5V) and being fed to the correct pins. Test each PCB individually before connecting it to the system. When populating the PCBs be advised that parts are VERY hard to remove in one piece unless you have a hot air gun. So make sure you insert them correctly especially parts that have a Pin 1 marking (all integrated circuits and resistor network RN1 on the main board). There are some glitches which can be easily fixed. 2. There is a glitch on the new Voltagse Sense Board. The temp sensor polarity is sort of swapped. So connect resistor R9 to the closest GND source (instead of VCC). Connect Pin 2 of JP1 to the closest VCC source. See pictures on the right for details. The ESP8266 acts as a wifi access point. SSID and password are printed on the instructions sheet included with you kit. Connect to the access point, then open your browser and type 192.168.4.1 to open the web interface. The STM32-H103 comes with a bootloader and a current software version. Both configuration and software updates are done via the Wifi interface. To update the inverter firmware extract the stm32_sineHWCONFIG_REV2.bin and upload it via the "Update" form of the web interface. The update takes about 2s and when it is finished the green LED should flash. Make sure you're not running a plot or gauges during firmware upgrade! You can also customize the web interface itself by replacing the respective files like index.html, index.js etc. Upload them with the same form as the firmware. This command will display all 4 values. To repeat the command, simply type "!". The current sensor gain depends on it's distance to the conductor (including the isolation). Your AC cable must run on the underside of the PCB between the pins of the sensor IC. Use a cable tie for mounting. The PCB should be placed far away from other high currents to prevent cross-talk. 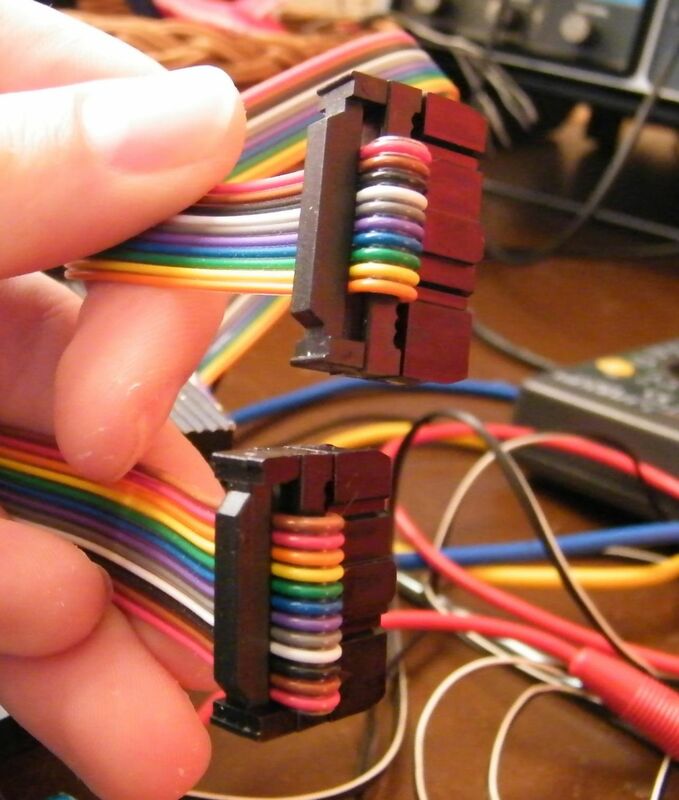 To increase your current range simple put a spacer between cable and PCB. Calibration is crucial to ensure correct operation of the over current limit! Connect the gate drivers with a ribbon cable like shown in the picture. Power up the inverter, which will now pull around 300mA @ 12V. 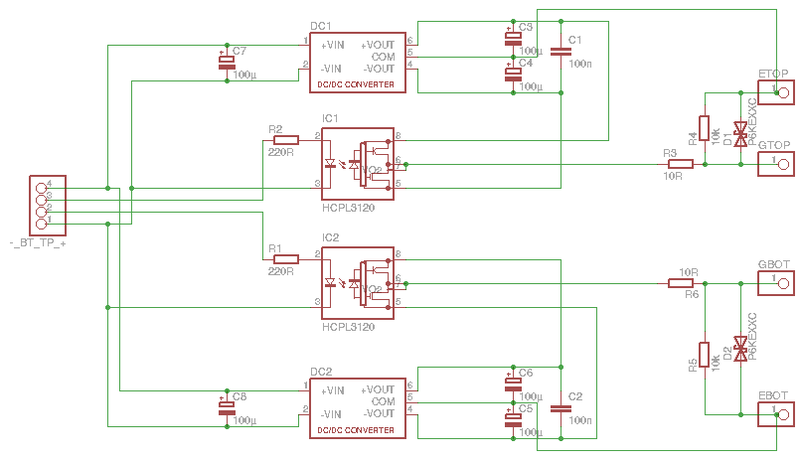 If its less, one or more gate drivers are unpowered, if its more, there is an error on the drivers or the connection. Remove power quickly in that case. The inrush current is higher of course, so set the current limit of your power supply to about 1A. This outputs a clean 50/50 duty cycle on all 6 PWM outputs. Verify this with a scope on the main board, the gate driver inputs and the gate driver outputs. Also verify that there is about 1.5µs dead time between GTOP and GBOT. Note that the sensor board has to stay connected at all times, otherwise the over current protection will kick in due to an implausible signal. Now you are ready for some more power. Connect the gate drivers to the IGBTs and repeat the steps above. The slope of the PWM will be less steep as to show that the gate driver is really working against the gates capacity. Connect a small voltage (like 30V) to the DC bus and verify that the PWM shows on the IGBT modules outputs and looks the same on all outputs. This circuit is completely symmetrical so the output should be symmectrical as well. If its not, there might be something wrong. There must be absolutely 0 current flow on the DC bus, otherwise you are experiencing shoot-through, i.e. the top and bottom IGBT of one leg are on at the same time. Correct this before continuing! This will start the inverter at 10Hz and the motor should spin at the corresponding speed. The motor should now spin up smoothly. Note that this controller only supports up to about 10000 pulses per second. So for example if you plan to spin your motor up to 10000 rpm which is 166.7 1/s the encoder mustn't generate more than 60 pulses per turn. The limit is imposed by the low pass filter and can be changed by populating a different resistor R3. Some encoders require more than the provided 3.3V operating voltage. In that case try to "steal" 5V from the sensor board output. 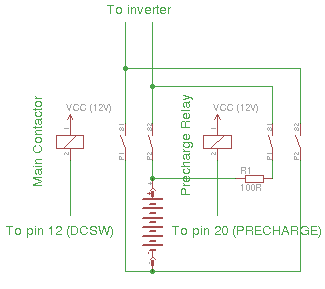 Alternatively you can leave out R2 and connect Pin 2 directly to 5V with a short wire. If the pot value leaves the window defined by potmin and potmax the throttle command is set to 0 and the error light is triggered. As you reach 30% of throttle travel the motor should start spinning. The harder you press the more it will accelerate until it reaches its maximum speed (parameter fmax, preconfigured to 200Hz). When you let go the throttle the motor will brake to a standstill. Once the whole setup is inside your car you can play with various parameters for fine tuning. The software supports the KTY83 and KTY84 temperature sensor. Other types might be supported in upcoming releases. Note that the sensor has a polarity. When connected the wrong way it will saturate at 120°C. So even if the temperature rises above 120°C it will be displayed as 120°C. Connect it to pin 21 (negative) and pin 22 (positive). 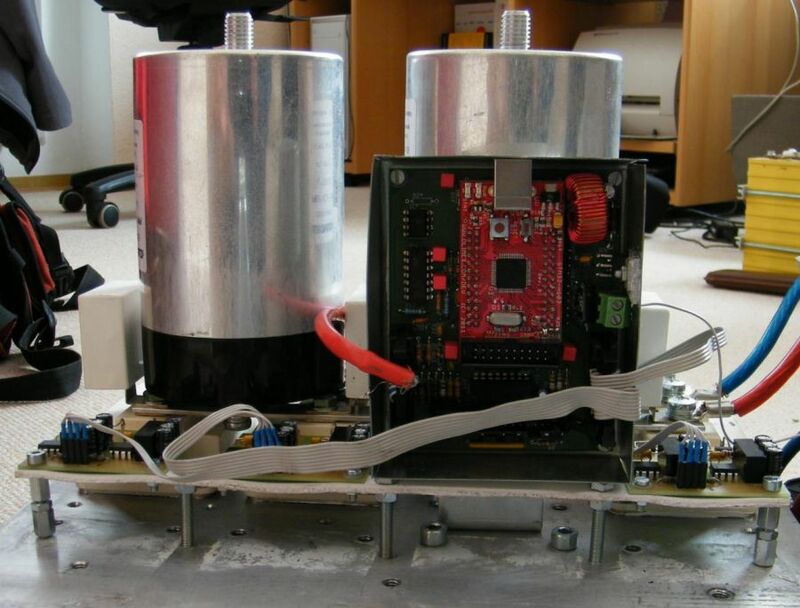 Some motors have a protection switch that opens at some threshold temperature. You can connect it to 12V and pin 11. It will stop the inverter immediatly if tripped. If your motor does not have this feature, connect pin 11 to 12V. The emergency stop serves a similar function. It can be installed in the drivers reach and will stop the inverter immediatly when 12V are interrupted (failsafe). 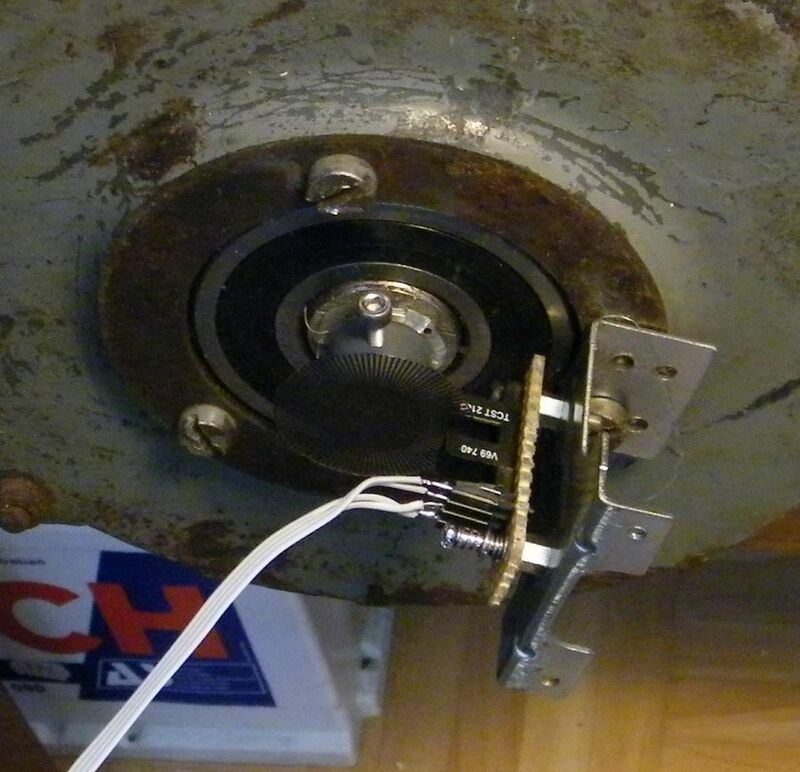 Connect it to 12V and pin 17. You can connect a 3-position switch for selecting the drive mode. Forward (pin 13) turns the motor in one direction, reverse (pin 15) in the other. If they are both low, no current is fed to the motor making this essentially the neutral position. There are detailed pages for main board, and gate drivers. Information about the softwares Parameters. 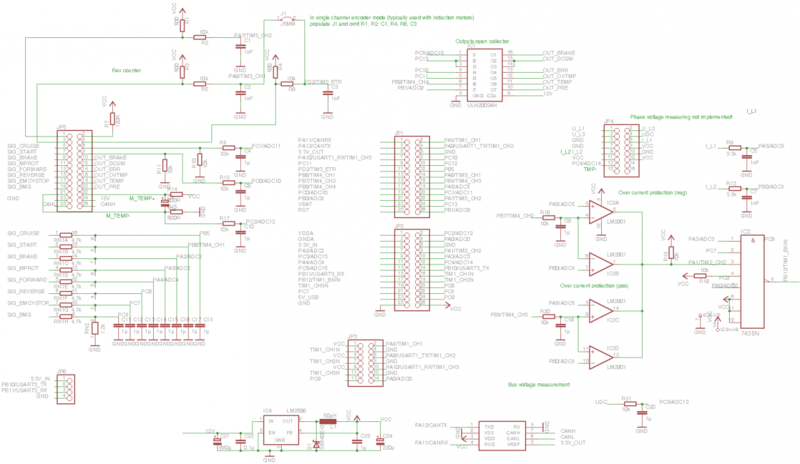 In-depth information can be found on the Hardware Principles and Software Principles page. Forum Post about experimental parameter setup.